Gerard van Honthorst (November 4, 1592 - April 27, 1656), also known as Gerrit van Honthorst and Gherardo della Notte, was a Dutch painter of Utrecht. He was brought up at the school of Abraham Bloemaert, who exchanged the style of the Franckens for that of the pseudo-Italians at the beginning of the 16th century. 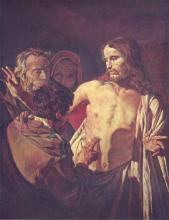 Infected thus early with a mania which came to be very general in the Netherlands, Honthorst went to Italy in 1616, where he copied the naturalism and eccentricities of Michelangelo da Caravaggio. Home again about 1620, after acquiring a considerable practice in Rome, he set up a school at Utrecht which flourished exceedingly. 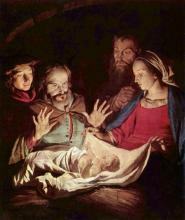 Together with his colleague Hendrick ter Brugghen he represented the so-called Dutch Caravaggisti. 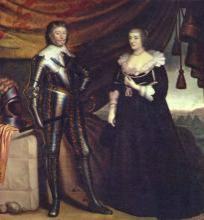 In 1623 he was president of his gild at Utrecht, where had he married his cousin. He soon became so fashionable that Sir Dudley Carleton, then English envoy at The Hague, recommended his works to the earl of Arundel and Lord Dorchester. 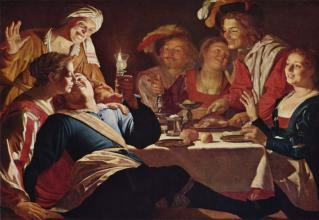 In 1626 he received a visit from Rubens, whom he painted as the honest man sought for and found by Diogenes Honthorst. The queen of Bohemia, sister of Charles I and electress palatine, being an exile in the Netherlands, gave him her countenance and asked him to teach her children drawing; and Honthorst, thus approved and courted, became known to her brother Charles I, who invited him to England in 1628. There he painted several portraits, and a vast allegory, now at Hampton Court, of Charles and his queen as Diana and Apollo in the clouds receiving the duke of Buckingham as Mercury and guardian of the king of Bohemia's children. Charles I, whose taste was flattered alike by the energy of Rubens and the elegance of Van Dyck, was thus first captivated by the fanciful mediocrity of Honthorst, who though a poor executant had luckily for himself caught, as Lord Arundel said, much of the manner of Caravaggio's colouring, then so much esteemed at Rome. 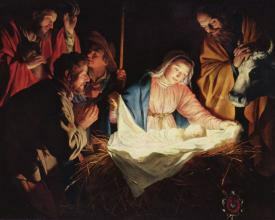 It was his habit to transmute every subject into a night scene, from the Nativity, for which there was warrant in the example of Correggio, to the penitence of the Magdalen, for which there was no warrant at all. But unhappily this caprice, though sublime in Allegri and Rembrandt, was but a phantasm in the hands of Honthorst, whose prosaic pencil was not capable of more than vulgar utterances, and art gained little from the repetition of these quaint vagaries. Sandrart gave the measure of Honthorst's popularity at this period when he says that he had as many as twenty apprentices at one time, each of whom paid him a fee of 100 forms a year.